> As of March 28, 2016, versions 1 and 2 of the Imgur API are no longer supported. > If you manage an application which relies on the API, we encourage you to migrate your application to Imgur API version 3. > If you need some assistance with that, feel free to check out api.imgur.com for documentation. > If your application uses authorization, you will also need to upgrade to oauth 2.0. > If you have any questions, we’d be happy to help at <email address hidden>. (1) registration/obtaining a clinet ID from imgur for their v3 api. (3) As the format of the json response for v3 api is very different, upload plugin code needs amending to properly extract and format the image and delete urls, to then return to the main shutter application. Needs a client ID to be registered and 'YOUR_CLIENT_ID' in code/patch replaced with that. Chiming in to note that this is broken in Fedora 23 as well. Ubuntu 14.04. I confirm this issue too. Unfortunately, I don't know any Perl. A patch with a client id. No images get attached to this account. Removed anything from output window, except: Image url, Delete url, Thumbnail small, medium, large and huge. The attachment "Imgur_upload.patch" seems to be a patch. If it isn't, please remove the "patch" flag from the attachment, remove the "patch" tag, and if you are a member of the ~ubuntu-reviewers, unsubscribe the team. I can also confirm that n[oO]ne's .pm file at https://bugs.launchpad.net/shutter/+bug/1565048/comments/14 enables users to upload images to imgur again and fixes this bug. Just reviewed and tested Imgur.pm revised by n[oO]ne. Yay, it works. Thanks! I can confirm the fix by Timothy Zorn to be working and included it into Arch's Shutter package. Could any of you please explain to me so I can explain to others, where I can download these updated file(s), and how to install them? Do I need to download just the "imgur.pm" file, or are there other files needed to get this working with "imgur", if so where? Are there new Shutter ".deb" packages available or a PPA for these updates? 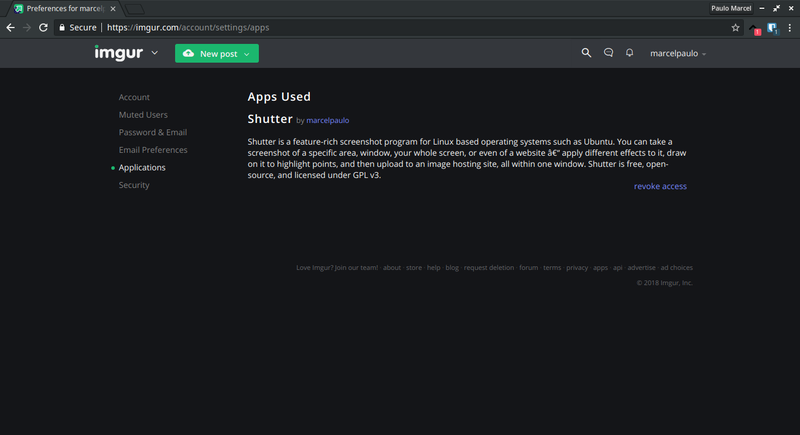 FYI: I am using Linux Mint 17.3 KDE and Linux Mint 18.1 KDE and using the "shutter-testing-team" PPA to keep my Shutter application updated, is this the correct one? Have these changes been uploaded to the Shutter PPAs? Why did this PR is not merged? I forgot to mention: upload to "Imgur Guest" is working fine. Confirmed. Imgur Guest is working fine by simply replacing the .pm file provided in post #14 above..thanks a bunch! CuXe: 0.94 should work without any further steps, is it not the case for you?